This marinade also goes great with shrimp or can be used to make tofu actually taste good for a vegetarian option. Mix together all of the ingredients in an oven proof baking dish. Add the chicken (shrimp or tofu), cover with tin foil and let sit for at least an hour (in the refrigerator). Even better, prepare it the night before and let it marinate over night. It will be so tender! When ready to cook, preheat oven to 350 F degrees. Place in the oven and cook for 40 minutes to 1 hour. Remove from oven and eat! 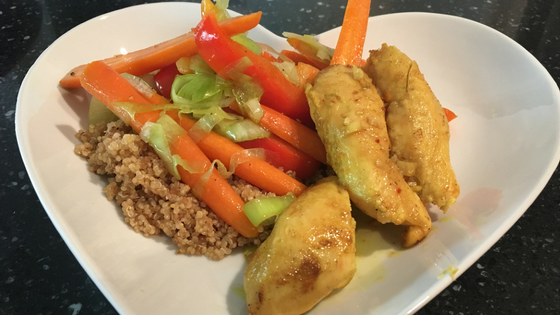 I served it with honey glazed carrots and lemon quinoa. For the carrots, sauté them in a large skillet with extra virgin olive oil. I also added a few slices of leaks and 1 red pepper, thinly sliced. 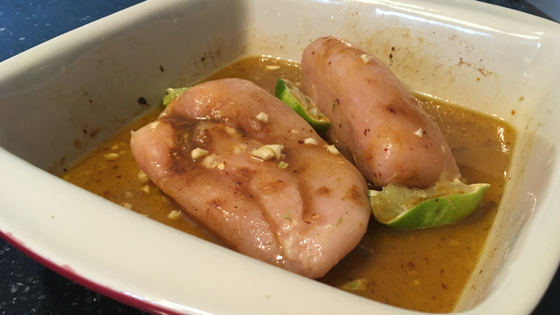 Just before they are tender, drizzle them with raw honey and cook for another 1-2 minutes. For the lemon quinoa, cook the quinoa according to package directions, but add the juice of 2 lemons. So easy!